It’s no secret that Jeremy Lin has been playing mostly well since being demoted to the bench in December. After a season-high 29 points on Sunday against Philadelphia, Lin will be rewarded with a return to the starting lineup on Tuesday at Oklahoma City. “It had nothing to do with last night but last night obviously made it a little bit easier to throw him in there because he played so well. We’ll see what happens on this trip,” Scott said. Ryan Kelly returned to practice on Saturday in a limited capacity but his status remains up in the air for Sunday’s game as he continues to battle a right hamstring injury. “He’s questionable but it’s more like doubtful. I want to see if he can go a full day of practice on Monday and then we’ll go from there,” Byron Scott said. In what marked one of the few bright spots of an otherwise failed Lakers season, rookie forward Ryan Kelly provided all sorts of signs that he belonged in the NBA. He epitomized what former Lakers coach Mike D’Antoni wanted with a so-called stretch four in his system: floor spacing and dependable outside shooting. Despite being hobbled last summer and the beginning of a training camp from a surgically repaired right foot that had not healed, Kelly impressed the Lakers brass enough both to land a spot on the roster and on the rotation. 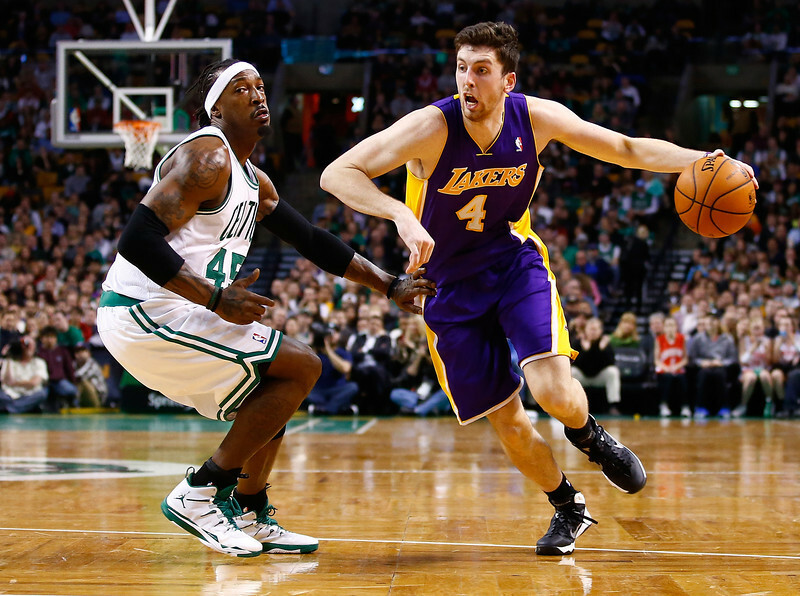 Despite being selected as the 48th in the second round of the 2012 NBA Draft, Kelly posted numbers that suggested he should have been selected higher with 8 points on 42.3 percent shooting and 33.8 percent from three-point range. But such efforts were not enough to make the NBA’s all-rookie first or second teams, as released by a panel of 125 sportswriters and broadcasts. Instead, the first-team honors went to Michael Carter-Williams (Philadelphia 76ers), Victor Oladipo (Orlando Magic), Trey Burke (Utah Jazz), Mason Plumlee (Brooklyn Nets) and Tim Hardaway Jr. (New York Knicks). The second-team honors included Kelly Olynyk (Boston Celtics), Giannis Antetokounmpo (Milwaukee Bucks), Gorgui Dieng (Minnesota Timberwolves), Cody Zeller (Charlotte Bobcats — now the Hornets) and Steven Adams (Oklahoma City Thunder). Kelly still received 29 points, placing him 14 overall behind Ben McLemore (Sacramento Kings), Pero Antic (Atlanta Hawks) and Nick Calathes (Memphis Grizzlies). But such numbers would have only been good enough to make the NBA’s all-rookie third team, if such a thing existed. It probably did not help the Lakers (27-55) had the sixth worst NBA record. Instead, Kelly’s play will likely entice the Lakers to grant him a $1.1 million qualifying offer by June 30 to make him a restricted free agent. As he ascended from a low-level second round pick into a fixture onto the Lakers rotation, rookie forward Ryan Kelly attributed a key variable that explained such growth. Oh, Kelly overcame a right foot injury that kept him out the entire 2013 offseason and parts of training camp. His basketball IQ made up for some of his physical shortcomings. Kelly’s work ethic expedited his learning curve. But he also credited Mike D’Antoni’s offensive system that puts a high value on so-called stretch forwards that can both shoot and space the floor tapping into that specific skillset. Yet, despite D’Antoni’s resignation this week stemmed from the Lakers’ refusal to assure they would exercise his team option for the 2015-16 season, Kelly expressed confidence that he could still thrive in another system. TORONTO — Ryan Kelly is far from big time. The Lakers rookie forward received a painful reminder of that when the team bus didn’t wait for him following the Lakers’ 107-104 victory Friday over the Boston Celtics at TD Garden. Even after posting a career-high 20 points on 6-of-12 shooting in 34 minutes, Kelly needed to hail a cab to go back to the team hotel. The Lakers are noticing his progress, though. So much that Coach Mike D’Antoni said he will start Kelly over Jordan Hill at power forward when the Lakers (15-25) play the Toronto Raptors (20-18) on Sunday at Air Canada Centre. Though he hasn’t fully healed his surgically repaired right foot, the Lakers officially signed second-round draft pick Ryan Kelly Friday in what will at least give him a chance to compete for a roster spot should he become healthy. Kelly has started running at 75 percent of his body weight on a treadmill, and Lakers athletic trainer Gary Vitti envisions him running at his full body weight in a “few weeks.” That means it’s safe to pencil Kelly out at least for the beginning of the Lakers’ training camp, which begins Sept 28 and runs through Oct. 25 with eight exhibition games. With a surgically repaired right foot still healing, there’s not much second-round draft pick Ryan Kelly could do with the Lakers. He couldn’t participate in any pre-draft workouts and fell to the 48th overall pick perhaps because of that reality. The former Duke product didn’t play on the Lakers’ summer league team. Only nine days before Lakers’ training camp begins, Kelly spent part of Thursday running at 75 percent of his body weight on a treadmill. Although he described Kelly as “completely asymptomatic,” Lakers athletic trainer Gary Vitti said that the training staff has taken a conservative approach toward Kelly’s rehab, making it unclear when he will return to the court.